Florian Christl is a new arrival in the classical and ambient music scene, and his debut album Inspiration was released in March of this spring. Though he has been a musician all his life, this breakthrough into the professional music world has afforded him recognition from many notables including Sony Classical record label and pianist and composer Nils Frahm. We were very fortunate to catch up with Florian and learn more about his recent success while he has already been on the road, playing concerts around Europe. Let’s start at the beginning. How did music enter your life? When did it become a central part of your life? Music has always fascinated me and played a very important role in my life. I started piano lessons at the age of 5 – I can still remember my very first lesson. I was so excited that I immediately knew, "That's what I want to do”! I found my great passion in music and playing the piano when I was 5 years old and this passion has not diminished even today - on the contrary! From day one I have invested every free minute in the music and worked on being able to describe myself as a "professional musician" one day. As a musician with less background in theory and formal instruction, do you feel this gives you any advantages in your composing and performing? Any disadvantages? In fact, this question has kept me busy for years. Of course, a basic understanding of musical theory is needed. But for me, music is not a purely theoretical arrangement of tones and chords. Music is a passion for me. Music is emotion and in my opinion, it cannot be forced into a given grid or constructed according to a schema. I want to create something new, let my inspiration run free and let the music be music. I think if I had studied music my tunes might sound different today. But I do not think it's a disadvantage for me not to have studied music – perhaps it is an advantage since I can pursue completely free my kind of composition, and thereby have a different view than a classically educated musician. I always had a clear goal in mind and knew what I wanted; I have taught myself and I am firmly convinced that this path and the years of work, self-study, and experience have made me the musician I am today. Could you walk us through your process of composition? What fascinates me about music is that you cannot plan or force it. Music just happens. I am sitting at the piano, improvising, and suddenly there is a melody that completely absorbs my current mood and carries it in itself: pure inspiration. From this point on, I am completely trapped in the music. I play the melody, develop it further. Meanwhile, I also hear the strings in my head. The piece actually comes out by itself. Sometimes it seems to me that the melody just waited to finally become audible. When composing, do you envision these other instruments or does that addition come afterwards? Do you ever compose with other musicians? I always compose alone. Composing is a very personal and emotional process for me. I shut out everything around me. In these moments, there is only me and my music. As mentioned above, a new piece builds up gradually in my thoughts. More instruments like the string parts I usually have in my ear right from the beginning. But sometimes a piece is completely finished and only at the hundredth play of the piece, I realise that something is missing. Then the creative process begins again from the beginning and the "real" piece is created. Like for example "Close Your Eyes," the second track on the album. When did you first realize that your music was gaining significant attention (from the likes of Nils Frahm and Sony Classical)? What was your reaction? What has happened in the last few months still feels somehow surreal. Record deal, photo shoots, video shoots, concerts, recordings in the recording studio, album release, #1 in the iTunes classic charts, upcoming Germany tour etc. My dream is about to come true... it's hard to understand! But there are always these little moments in which I really understand for a few seconds and perceive what is happening here. These are moments of absolute happiness in which tears of joy come to my eyes every time. I'm overjoyed and thankful and I'm looking forward to the coming time. Your very recent debut album, ‘Inspiration,’ was released this spring, but it sounds like you’ve been composing and performing your own music since 2013 or earlier. Have the songs of ‘Inspiration’ simply evolved over the years into the form they are now? Or are there original compositions of yours prior to ‘Inspiration’ that do not appear on this album? On this album, I have united my highlights and favorite pieces from my previous musical work. All pieces are original versions. C'EST LA VIE is e.g. already created in 2011, CLOSE YOUR EYES or DESIRE were created in 2017. You have taken the music of ‘Inspiration’ on the road to perform at various concerts across Europe so far. Will you continue this tour of concerts beyond May or return to compose more music for the future? Or, have you already been creating new music while on the road? The past few months have been such an inspiring time for me. I've already written so many new songs, I could go straight to the studio and record another album! But of course, we'll go on tour and do as many concerts as possible to present to the audience my debut album ‘Inspiration.’ We are currently planning further dates for this year. As you have grown as a musician into the position you now occupy, is there anything you would like to change? Or anything you would have done differently up to this point? I would do everything exactly like that again. As I said, I think that all the decisions, obstacles and events in my path have made me the musician that I am today. The music video for the song ‘Fly’ is astonishing. How was this video made? Can we expect to see more visual art such as this music video in the future? The video shoot was a terrific and inspiring experience. We packed an old piano in the VW bus of my buddy and we drove to Austria in the Alps. There we put the piano right in the middle of nowhere and filmed it. 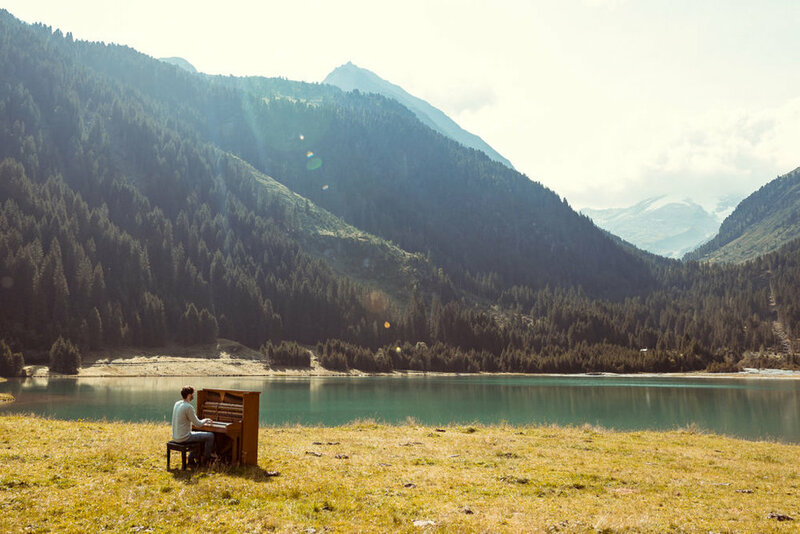 Sitting at the piano with a view of the mountain lake, glacier and the breath-taking alpine panorama was simply indescribable. We will definitely produce more videos of this kind in the future. If you could choose one musician to spend a day with in the studio, composing or sharing ideas or maybe just hanging out – who would you pick? In the studio: Daniel Hope. Composing, sharing ideas: Woodkid. Lastly, what kind of new things can fans of yours get excited about in the near future? What new projects are in the works? I stand right at the start of a hopefully long musical journey, full of ideas, inspiration and zest. However, at this moment I’m focused on the presentation of my latest album INSPIRATION. At the same time, I'm working on a sheets book for my album INSPIRATION, which will hopefully be released in the middle of this year.